Thankfully Takamine serial numbers are a little more straight forward than some other guitar companies. This article will look at what your Takamine serial number can tell you about your guitar and how to decode that number. The main things that Takamine’s serial number tells you is the date your guitar was built – more specifically the month and the year – not the exact day. It also tells you which number guitar produced your guitar was, during the particular month – i.e. the 1st guitar that month, the 22nd, the 1,000th etc. This might give you some clue as to the day in the month it was made but not an accurate one – for example, if your guitar was the 5th built that month, then it was likely to be on one of the first days of the month. But for most, the exact day of build and the sequential number it was built in that month, isn’t that important anyway. So, the main thing this serial number will tell you is finding out the month and year of build. Takamine serial numbers are typically found on the neck block (where the neck joins the body) on the inside of the body of the guitar. Now we come the important part – decoding the serial number. Thankfully this is fairly straight forward when it comes to Takamine, though there are, as usual, a few extras. There are a couple of different serial number systems depending on which model and depending on where they were made and distributed. Takamine’s Pro Series (which is pretty much all of their series except for the G series) models follow an 8 digit serial number system. The first 2 numbers represent the year of production. The next 2 numbers represent the month of production. The last 4 numbers represent the sequential order of that guitar for the month. O.k. so pretty straight forward right. But let’s take a look at an example to make it really clear. From our example serial number we can see that this guitar would have been built in 2008 (08), in April (04) and it was the 781st (0781) guitar built that month. Said another way, this was the 781st Pro Series guitar that Takamine built in April of 2008. However, this system is only relevant for up to the end of 2012 – after that they adopted a new system (see overseas models below). O.k. did I say that Takamine’s serial number systems were straight forward – o.k. I might have lied, just a little. The G series is the exception. There is no discernable system for G Series models. No decoding going on here, unfortunately. 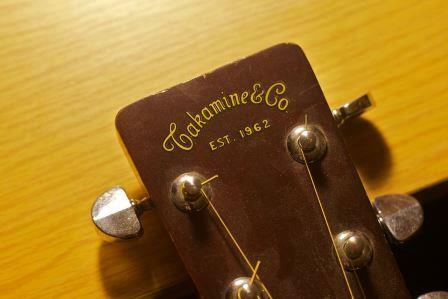 Note that Takamine is a Japanese guitar manufacturer (more on Takamine’s History). Any models that were distributed in Japan, as opposed to internationally, used a slightly different serial number system. It’s still an 8 digit system and the 1st two digits still represent the year, the second two digits still represent the month, and the last 4 digits still represent the sequential order that the guitar was built in that month. The difference is the first two digits for the year. These digits represent the number of years since Takamine’s began in 1962. For example, if the first two digits were “40” then that would represent 2002 (1962 + 40 years). Towards the end of 2012 models distributed overseas started to use the same serial number system as those that are distributed in Japan. This would represent the 213th (0213) guitar built in May (05) 2013 (1962+51 = 2013). Apart from the G Series models, Takamine’s serial number systems are fairly straightforward and easy to understand. If you have a G Series guitar, you might want to contact Takamine to see what they can tell you about the guitar. Otherwise, you should be able to decipher the year, month and the sequence in that month that your guitar was built. Any questions or comments please feel free to leave them in the comments section below. I just inherited a Takamine g 132s series guitar and don’t know anything about it….Help. By my calculations and my understanding of Takamine’s serial number system, this was the 378th guitar built in June 2008. Apart from that it sounds like it’s the C132S, which has solid rosewood back and sides and a solid cedar top – and is a classical (Nylon string) guitar. It’s not something I’ve played but sounds like a very nice guitar to inherit by the sounds of it. I have a G332 model I got when I was a kid. Thinking it about 35-40 years old. So not sure what year it is. Any help would be appreciated. With the G series you basically have to guess the year, as to where it was made. G332, approx 35-40 years old, made in Taiwan. S34C is a Jasmine. More than likely from the 90’s especially if made in Korea. I Have inherited a Takamine EF 340 S with a serial Nu S1011769 and I’m trying to determine year and value, Can you help me out? Recently gifted a guitar I believe to be a “lawsuit” (Martin like) guitar with head stock similar to picture above G330 w SN 86010121. Normally a Jan of ’86 121 off the line. Were these Chinese made guitars and what is the view of this guitar relative to sound quality. Can someone tell me how I figure the date it was made? I just acquired a GS330S and none of pertains to my Guitar?? It says made in Bloomfield CT. with a 9 digit serial number! Can you help in any way to figure out just what I have ??? I have a Takamine which serial number is 91081276. I don’t know which model it is because there’s no label. I can say that that it’s a red burst type D. Could you guess which model is my guitar and it’s estimated price? Do you know something about gx200 (electric guitars from 80′) serial numbers. Thanks! Bought a Tak EG 4400 seven or eight years ago (serial TC10100538 ) from Musicians Friend. It was a return that had been marked down. I love the damn thing but I can’t find any information about it. There is no mention of this particular model on Takamines website. I have a Goya jumbo guitar but inside it says Takamine serial number 78040702. I was wondering if you could help me out to find more about my guitar. Hi. I bought my Takamine in 1978 as a 17yo and still have it. The serial number is 78052773 so obviously a May built 1978 guitar and the 2773th instrument that month. It has lost its model sticker and I can’t remember what it is. Is there any way to identify the guitar from the serial number? It’s still in great condition and now has a lovely mellow tone, so will stay with me until I “expire”.